Ocean FX is a powerful spectrometer with features and functionality that make it our fastest and most “communicative” spectrometer yet. With a fast detector and redesigned and upgraded electronics, Ocean FX achieves acquisition speed up to 4,500 scans per second, has onboard processing for improved SNR and reduced data transfer time, and offers robust communications via USB, SPI, Gigabit Ethernet and Wi-Fi. Ocean FX is an excellent choice for high-speed process applications, measurement of fast events such as flicker and color cycling in LEDs, and reaction monitoring. Like other Ocean Optics spectrometers, Ocean FX provides different modes for acquiring data. The default acquisition mode is Normal mode where the spectrometer is “free running” and continuously scanning, acquiring and transferring data to the computer according to user-specified acquisition parameters set in the software. This mode is used for applications that do not require the synchronization of data acquisition with an external event like a button push, lever activation or laser pulse. Synchronizing the spectrometer with an external event requires the use of triggering. External Triggering – Synchronization between an external event and spectral acquisition. An event outside the measurement system (such as a push button, lever activation or laser pulse) increases or decreases the voltage level going to the spectrometer’s trigger pin, instructing the spectrometer to begin or end a spectral acquisition. Triggering an External Event – Controlling an external device with the spectrometer. The spectrometer instructs an external device (typically a lamp such as the PX-2 pulsed xenon or other light source) to illuminate immediately prior to spectral acquisition. Lamp Enable. This signal is useful for enabling and disabling light sources with a TTL enable input. External Trigger. This signal is useful for synchronizing trigger events with other external equipment. Single Strobe. This signal is useful for sending a discrete pulse to enable a light source or trigger another device. This is sometimes tied to the external trigger input of another spectrometer to synchronize the integration periods of each device. Continuous Strobe. This signal is useful for synchronizing pulsed light sources, such as pulsed xenon, with the period of integration. When synchronization with external events is required, Ocean Optics spectrometers have multiple triggering modes available. These modes enable automation of spectral acquisition with an external event, whether it’s a light source illuminating or an event happening during a process. This makes Ocean FX ideal for use in process environments or for unattended data collection. For example, data logging combined with triggering can be used to monitor a parameter over time. By adding a software trigger to this measurement, a signal can be sent back to the system when a certain threshold or level of the parameter has been reached, resulting in complete automation of the process. LIBS Spectroscopy. In laser induced breakdown spectroscopy (LIBS), a laser is used to generate a plasma at the surface of a material, generating a unique spectral signature of atomic emission lines that can be used to determine elemental composition. The spectral acquisition must be carefully timed relative to the laser pulse to capture atomic emission during the short lifetime of the plasma. Measurement of Fast Phenomena. Spectroscopy can be used to look at the characteristics of sparks, explosions, gunfire and other rapid events. Triggering to synchronize with these events allows for more detailed characterization and measurements at different points during these rapid events. Production Line Measurements. Processes or products in motion (for example, on a conveyor belt or rollers) need to be measured at very specific points in time to ensure the right samples or proper sample location is measured. Synchronization with other measurements within the process is sometimes needed as well to ensure maximum yield of the highest quality products. The triggering functions for the Ocean FX provide accurate timing and synchronization between the spectrometer and other devices. Multiple low-jitter trigger modes are available in addition to the normal, free-running spectral acquisition mode. Triggering provides precise timing between devices. A spectrometer can be triggered causing it to turn a light off or on, pulse a light source, or start or end a spectral acquisition. Several modes are available to enable the synchronization of data acquisition with an event outside the measurement system. These external triggering modes involve connecting an external triggering device to the spectrometer and then providing an external trigger to the spectrometer. The length of the integration time (time over which spectral data is acquired) and the source controlling the data acquisition cycle depend upon the external trigger mode chosen. A description for each of the Ocean FX triggering modes is shown in the table below. Spectrometer is continuously acquiring spectra, back-to-back, based on the acquisition parameters set in the software. When the software requests a spectrum from the spectrometer, the spectrometer waits for the current acquisition to complete. At the start of the next acquisition, the spectrum collected during the previous acquisition is transferred to the software. Spectrometer is idle until a trigger is applied to the spectrometer as a continuous voltage. When the spectrometer receives the trigger, it acquires a spectrum for the integration time specified by the user. The spectrum is then transferred to the software. If the voltage is still high after spectral acquisition and transfer, the spectrometer will acquire another spectrum and transfer it to the software. When the voltage decreases to zero, the spectrometer returns to an idle state. Note: External Hardware Level Trigger is not as precise as the External Hardware Edge Trigger (described below). Acquisitions continue at the user specified integration time as long as the voltage is high. Use this mode to acquire as many spectra as possible when the voltage is high. Spectrometer is idle until a trigger is received as a voltage pulse (voltage increases from 0 to 5 V or decreases from 5 to 0 V). When the spectrometer receives the voltage pulse, it acquires a spectrum for the user specified integration time. The spectral data is then transferred to the software. If data transfer is followed by a new voltage pulse, the spectrometer will acquire another spectrum and transfer it to the software. If no voltage pulse is received after data transfer, the spectrometer will go back to an idle state until a new voltage pulse is received. Note: The External Hardaware Edge Trigger is the most precise triggering mode. With each trigger, only one spectrum is acquired. A voltage pulse is required for each spectral acquisition. The trigger is on the voltage transition (Rising Edge 0 to 5 V and Falling Edge 5 to 0 V). Mode requires commands available only in OmniDriver, SeaBreeze or Ocean Binary Protocol (OBP)*. See below for more details. Spectrometer is idle until a trigger is applied to the spectrometer as a voltage pulse (voltage increases from 0 to 5 V). When the spectrometer receives the voltage pulse, it acquires a spectrum until it receives a second voltage pulse. With the second pulse, the acquisition is terminated, spectral data is transferred to the computer and a new spectral acquisition begins until another pulse is received. Integration time is determined by the distance between the pulses. Note: Use Synchronous Hardware Triggering when you do not know how long an event is (do not know what integration time is needed). This trigger mode is used to control the integration time with the trigger pulses. Spectrometer is idle until a trigger is applied to the spectrometer as a voltage pulse (voltage increases from 0 to 5 V). When the spectrometer receives a voltage pulse, it acquires a spectrum until it receives a second voltage pulse. With the second pulse, the acquisition is terminated and spectral data is transferred to the computer. Once the acquisition is complete, another pulse must be sent to start an acquisition followed by a second pulse to terminate it. * Ocean Binary Protocol is a communication protocol used by the Ocean FX spectrometer and other devices. OBP allows stateless communication with a device over any bus (USB, RS232, Ethernet, Wi-Fi, AP Wi-Fi, SPI) by encapsulating command-specific data in an explicit header and footer structure (including protocol version, message length, and status flags). Buffering. This setting enables onboard buffering. The Ocean FX has onboard storage used for buffering spectral data. If buffering is disabled, the onboard storage is cleared prior to storing the next spectrum. When buffering is enabled, data is acquired and stored in the onboard storage. The Ocean FX onboard buffer can hold up to 50,000 spectra. Back-to-Back Acquisitions. Unique to the Ocean FX spectrometer, this setting enables the back-to-back acquisitions possible with Burst Mode. Data is stored onboard the Ocean FX until the user-specified number of acquisitions is complete. For each trigger event received, the Ocean FX will retrieve this many spectra back to back at the maximum acquisition rate of about 1 spectrum every 222 µs. Software Triggering. This setting allows for software-controlled triggering. Rising Edge Hardware Triggering. This setting allows for trigger events to occur on the rising edge of the external trigger signal (see the Ocean FX Trigger Modes table above for more details). Falling Edge Hardware Triggering. This setting allows for trigger events to occur on the falling edge of the external trigger signal. Level Hardware Triggering. This setting allows for trigger events to occur while the external trigger signal is held high. Synchronous Hardware Triggering. This setting allows for trigger events to occur following the detection of a pulse on the external trigger signal. The next pulse will begin the process of ending the current acquisition. The next acquisition will follow immediately after the current acquisition is complete. Onboard Averaging. This setting enables onboard spectral averaging. Trigger Delay. This setting allows for the delay of a spectral acquisition until a trigger is received. This setting can be useful when interfacing with the single or continuous strobes. Synchronous Hardware Start/Stop Triggering. This setting allows for trigger events to occur following the detection of a pulse on the external trigger signal. The next pulse will begin the process of ending the current acquisition. The next acquisition will begin after another pulse is detected. The Ocean FX has a large onboard memory that can store up to 50,000 timestamped spectra. This buffer enables the Ocean FX to acquire multiple spectra into its onboard buffer for each trigger event that occurs. These enable a single trigger event to result in the acquisition of up to 50,000 spectra at the maximum rate for the Ocean FX (10 µs integration time). The trigger event may be a software or hardware trigger. Spectra can then be read out from the onboard buffer to OceanView software. In OceanView, Burst Mode is used to acquire spectral data at the fastest rate possible with the Ocean FX (as fast as 4,500 scans per second). When Burst Mode is enabled, the user specified number of spectra are acquired and written to the onboard buffer of the Ocean FX. Once all the spectra have been acquired, the data can be written to a file by OceanView. Additional details on how to use Burst Mode, set up hardware for external triggering, or trigger using OceanView software are available in the Ocean FX Miniature Spectrometer User Manual. LIBS is a powerful technique for rapid, real-time elemental analysis of a wide range of materials, from metal and gemological samples to chemical and biological agents. With LIBS, there is virtually no sample preparation necessary and detection sensitivity is possible to parts-per-million and parts-per-picogram levels. LIBS measurements are made using a high-intensity, pulsed laser beam focused on the sample. From 50 to 200 millijoules of power are delivered to the sample using a 10 nanosecond-wide laser pulse. The power of this focused laser energy creates a plasma at the surface on the sample. This plasma ablates a small amount of the sample into the plasma. As the plasma cools (~1.0 microsecond after the laser pulse), excited atoms from the sample ablated into the plasma emit light of characteristic wavelengths distinct to the elements present in the sample. With a plasma that changes very quickly, precise timing and triggering is a critical part of LIBS measurements. Accurate synchronization between the spectrometer and laser pulse are required to ensure data acquisition at specific timepoints during the plasma lifetime. We used an Ocean FX spectrometer in a LIBS setup to capture LIBS spectra for various pure metal samples. We used external hardware edge trigger mode with the trigger occurring on the rising edge of the voltage increase. The laser provided the external trigger to ensure synchronization with the laser pulse. The laser was used to trigger the Ocean FX by connecting the “Lamp Sync” port of the Laser to the External Trigger In pin (pin #2) of the Ocean FX DD4 external connector and the "Ground" port of the Laser to the Ground pin (for example, pin #1) of the Ocean FX DD4 external connector. Figure 1. Optimizing LIBS measurements typically requires synchronizing the laser pulse with spectral acquisition. 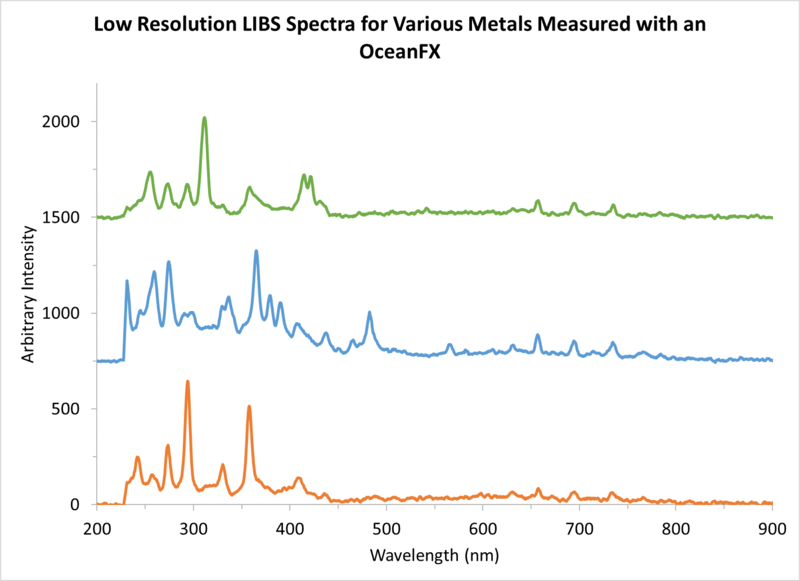 Figure 1 shows low resolution LIBS spectra acquired for metal samples with a single Ocean FX spectrometer and 50 mJ Nd:YAG laser. In this example, we used an Ocean FX covering the region where all elements emit. This wide spectral range with a single Ocean FX spectrometer yielded low resolution LIBS spectra. Higher resolution LIBS spectra could be acquired with an Ocean FX configured to cover a much narrower spectral range. The other feature to note in these spectra is the intensity of the UV peaks. The detector used in the Ocean FX has enhanced UV sensitivity to improve the detection of UV emission lines.